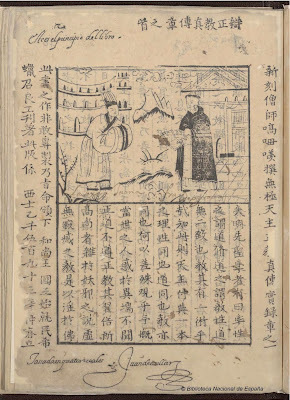 The Biblioteca Nacional de España has digitized the only known copy of the Shih-lu, and—with a little prodding from this blogger—made it freely available online. The entire book may be downloaded here: Shih-lu (pdf). To see its bibliographic record, click here: Shih-lu. Note that, like most books in Chinese, the Shih-lu may be described by those not from China as having been printed back-to-front. This means, concretely, that the Shih-lu's first page is not found at the beginning of the file, but toward the end, specifically page 155. A brief history of this book follows below. Much more has been written since then about the first two books printed in the Philippines in 1593, but most either refer to just one book—usually the Doctrina Christiana in Spanish, romanized Tagalog and baybayin—or, contrary to the evidence in the governor's letter, even three! Many of the authors apparently had not read Piet van der Loon's "The Manila incunabula and early Hokkien studies" (Asia Major  12, 1-43), which clearly lays out his reasons for concluding that the third "first book" was actually printed later, perhaps in 1605. But one of the most problematic assumptions of many who write about the first Philippine imprints, at least to me, is that the Shih-lu was merely a translation of the Spanish-Tagalog Doctrina Christiana. Now that the Shih-lu is available online, and its contents can easily be compared and contrasted with the Doctrina Christiana, even someone with no knowledge of Chinese, Spanish or Tagalog will see right away that the two are very different books. Special thanks to Lourdes Alonso and Cristina Guillen of the Biblioteca Nacional de España for their effort in making the Shih-lu freely available online, and to Francis Navarro for his assistance in Madrid. Below are the link to my article, which was published recently in Philippine Studies 58:3 (2010), 313–348, as well as the abstract and acknowledgments. In 1960 a mimeographed history textbook, which was considered groundbreaking for looking at Philippine history from a Filipino perspective, was introduced at the University of the Philippines. By 1967, when its second edition entitled History of the Filipino People was published in hardcover and paperback, it had replaced prescribed texts in other universities. Fifty years after the first edition came out, its eighth edition remains required reading for many college students. Using archival documents, this article traces the untold story of a forgotten chapter in this book and argues that the study of a book’s history illumines the influence of political realities and personal relationships on the publication of history books. I would like to thank Ambeth R. Ocampo, who suggested that I look into the history of History of the Filipino People; Salvacion M. Arlante, who granted access to the Teodoro A. Agoncillo Papers, as well as facilitated introductions to resource persons; Teodoro V. Agoncillo III and Bernardita R. Churchill, who not only answered my questions and welcomed me into their homes, but also generously shared books and documents; Milagros C. Guerrero, Antonio C. Hila, Oscar L. Evangelista, and Caroline Garcia, who provided useful background information; Elvira B. Lapuz, Grace B. Tabiendo, Klit Pabalan, and Janssen Cusi, who facilitated my research; Cynthia Kutka, who just happened to have a hard-to-find copy of the Agoncillo-Guerrero third edition (R. P. Garcia) and gave it to me; and all those who offered suggestions and asked questions that helped improve the manuscript, especially my adviser Patricia L. Fleming, Christine V. Lao, Vyva Victoria M. Aguirre, Tarleton Gillespie, and the two anonymous readers. All errors, however, are mine alone. 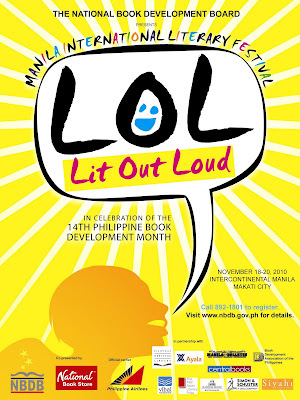 When will the Cebu City Public Library Re-open? 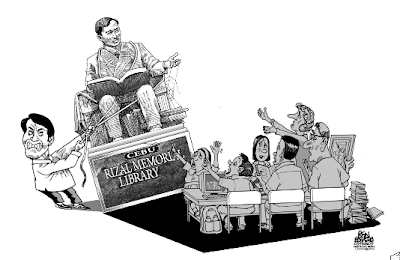 In December 2008, an announcement was made that Cebu City's Rizal Memorial Library would be closed for good. Pressure from Friends of the Cebu City Public Library, with the help of media exposure, led to the welcome news that the building would be renovated for three to six months and the library restored. The renovation, however, has still not been completed, even though a report indicated that "Acting" Mayor Michael Rama wanted the library fully renovated before the end of the year. The mayor and vice mayor do not seem to be talking to each other, as shown by conflicting pronouncements made in newspaper articles. Is the library's renovation getting caught in an election-related matter? The supplementary budget has been approved, but has it been released? If the funds have been released, why is the renovation taking so long? Or is this delay related to the upcoming election as well? Library associations and librarians in North America go crazy with press releases and blog posts when library closures are announced. But except for Mindanao Librarian, not a word has been heard (or at least, I haven't found anything online) from the Philippine Librarians Association or the Cebu Librarians Association. If even librarians don't think a library closure is worth fighting, does that mean it's time to close the library? I know that I should have written about this earlier, but I'm writing about it now. 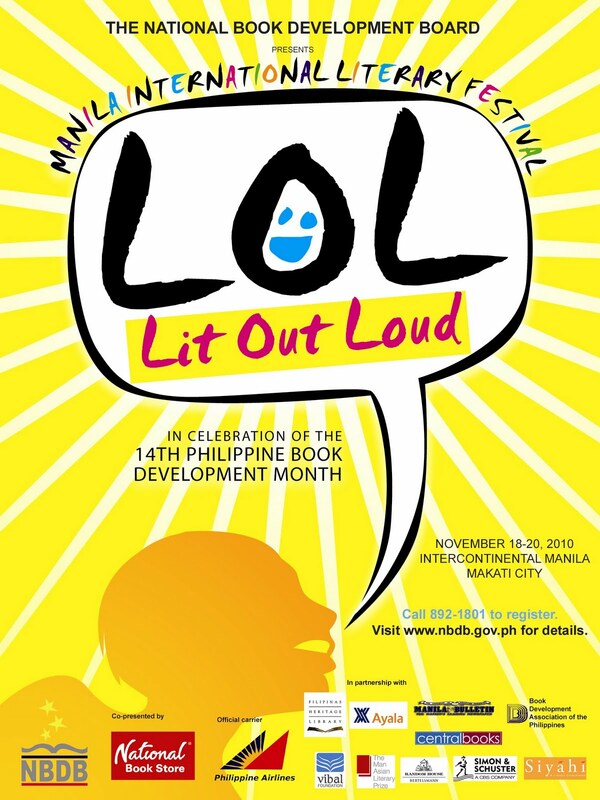 And I hope that Filipino librarians in the Philippines, especially those in Cebu, will take it from here. At the very least, I hope someone can answer my questions above. On 18 February 2010, this blog will be five years old. My very first post was "Mabuhay!" I plan to revisit some old posts and perhaps make good on some promises that I never fulfilled. I'm thinking of holding a contest for the readers of this blog with a prize of US$100, but I can't think of an appropriate contest. Any ideas? The 2009 Philippine Librarians Association, Inc. (PLAI) National Congress was held last 25-27 November 2009 at Heritage Hotel Manila. There are lots of photos at PLAI-STRLC (1 2 3 4) and The Multiplying Gorilla (1 2 3), but very little commentary. Fortunately, another librarian was taking notes. 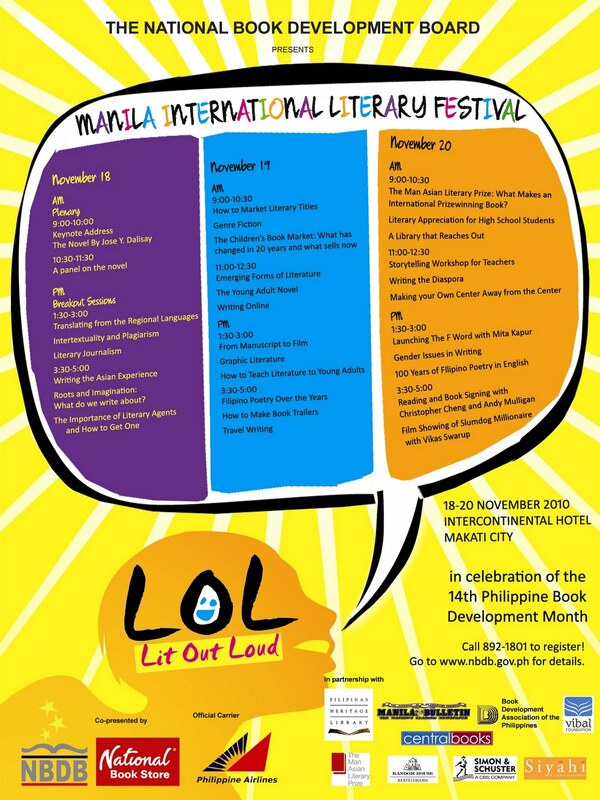 If anyone else would like to write a guest post for this blog about the PLAI Congress or any other library-related topic, send me an email at von-dot-totanes-at-gmail-dot-com. I was delighted to attend the 2009 PLAI Congress. As a U.S. Librarian, I have attended many library conferences, but this was my first time to attend a PLAI conference. I am no stranger to Philippine libraries, as I first began researching libraries in the Philippines in 2005 with a research grant, and have made return visits, plus kept continued ties with many Philippine libraries, since. Also, as chair of the American Library Association International Relations Roundtable Orientation Committee, it was my pleasure to bring brochures and flyers from ALA, on paper/poster opportunities available to Philippine librarians. The 3-day PLAI congress was most informative. The theme was environmental sustainability thru libraries, and a variety of experts on environmental topics presented, including ways of "going green" by Prof. Antonio Oposa of UP, and legal issues of sustainability for libraries, by Atty. Noel Ramiscal, also of UP. Aside from the program, the congress's venue (meals, location, etc.) were very nice at the Heritage Hotel Manila. No conference is without a few challenges, of course. One was several late or absent speakers. Another was practical application to libraries. I spoke with several librarians attending, and asked them how they were enjoying it. They said "It's good... there was lots of good information on pollution, waste, etc... but we know that. We want more SPECIFIC suggestions on what, exactly, libraries should do." I was impressed with their motivation and interest. Environmental issues are ones that U.S. libraries struggle with as well. As I continue my cross-cultural, comparative research on Philippine libraries and libraries of other Asian countries, I'll be sure and share my findings through this blog. My heartfelt appreciation to the organizers of the PLAI Congress for their hospitality in welcoming me, and to the many wonderful librarians I met and reunited with. Philippine hospitality is absolutely amazing! Thank you all! Maraming salamat po! At the beginning of 1999, I was still an assistant manager at Bank of the Philippine Islands with my own car. But after four years of working at a bank (including going through a merger! ), I resigned, gave up the car, and eventually made my way to Arvisu House, a Jesuit prenovitiate, where I discerned whether my future lay in religious life. After it became clear in 2000 that the Jesuits and I were better off as friends (as opposed to “married” LOL! ), I left for Cebu to teach Religion and Business English at Sacred Heart School for Boys (see "Introducing Gen X to the Bible"). At the end of SY 2000-2001, I returned to Manila and drifted from the Social Security System (as a consultant) to Loyola School of Theology (as a part-time graduate student and assistant editor) to Parlance (as a supervisor), until I decided to go back to school full-time for a master’s degree in library and information science (MLIS) at the University of the Philippines (instead of an MBA at AIM) toward the end of 2002. I finished my MLIS, began working at Asian Development Bank (as a records assistant) and obtained my librarian’s license in 2004 (see "Librarians: Already... But Not Yet"). 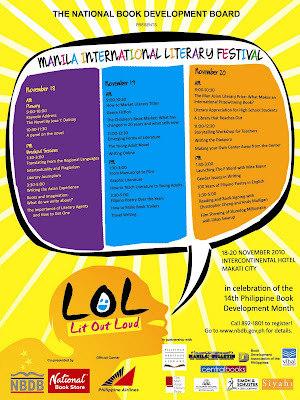 In 2005, I started blogging (see "Mabuhay"), received a travel grant to attend a librarian’s conference in Toronto (see "Librarians as Leaders"), wrote an investigative report for the Philippine Center for Investigative Journalism (see "By Vernon R. Totanes"), and got hired to teach Research and Library Management at UP’s then-Institute of Library and Information Science (see "Gainfully Employed"). I submitted my application to do my PhD at University of Toronto while I was an assistant professor at UP, and by the end of SY 2005-2006 I learned that I had been accepted (see "PhD - Information Studies"). On the way to Toronto, I wrote some more for PCIJ (see "Edsa 20/20: One Year Later") and was given another travel grant (see "Open Access in the Third World"). From 2006 to 2009, I travelled back and forth between Toronto and Manila to attend classes and do research. Perhaps the most significant event in my life during this period that was not directly related to my profession as a librarian or my status as a PhD student was my stint as a game-show contestant on "Kapamilya Deal or No Deal."